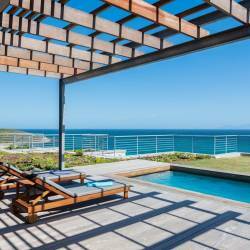 Leopardstone Hill Country Cottages in Noordhoek, Cape Town, invite you to their fynbos paradise, situated high on the slopes of the Noordhoek Valley with views towards the Atlantic Ocean. Accommodation at Leopardstone Hill is provided in two charming self-catering cottages, Pebble Beach and Stone Mountain Cottage. Stone Mountain Cottage comfortably accommodates 6 people in 3 bedrooms. The cottage has a private entrance, parking for 2 vehicles and a private garden. Situated behind the cottage is an outdoor shower with hot water and seaviews. The cottage has an open plan kitchen, dining room and lounge, all furnished to high standards. Upstairs is a romantic loft with private lounge. In winter, guests are provided with wood for the jetmaster fireplace. The quaint Pebble Beach Cottage, decorated in a coastal theme, sleeps 4 guests in two bedrooms (1 x double room and 1 x twin room). 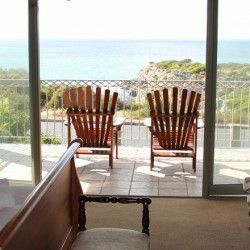 The cottage has an open plan kitchen/lounge and the large sea-facing deck has spectacular views, a second deck houses the barbeque facilities. After a day exploring the coves and endless stretches of white beach or hiking in the surrounding Noordhoek Mountains, the crystal clear water of the plunge pool set in natural rocks is a welcome relief. Relax in the hammock while sipping one of the Cape's fine wines.